The door to my studio, which I just painted with chalkboard paint so I could create this welcome sign for visitors. The first wall you see when you enter the studio. I have my artist statement next to this very personal painting. One of the highlights of Friday evening was having a visitor thank me for telling "my story". The second wall that is part of the entrance hallway. The small painting with the yellow flowers is the painting I sold today. The wall leading into the closet hallway...the one with my "woman" paintings. Another interior shot--facing the windows. Two things--I love that vibrant tablecloth. I wish it was fabric, but it's paper. Also check out my new bins, helping me staying organized! The table where I display my cards. Just wanted to check in and post some pics from the Art Crawl. Day 2 is done. Tomorrow I wrap things up. It will probably be the slowest day...Sunday always is, plus the weather looks questionable. I'll write more later, but I just want to say that so far things have gone very well. I've been delighted that the weather has been very good so far...a few days ago it looked like it would be cold and rainy. It's been a little cool, but not a drop of rain. The pleasant weather has definitely helped bring out people. As in the past, the Art Crawl has been a wonderful event. So often as an artist, you work in a vacuum...with very little feedback on what you're doing. In some ways, while you are creating, that's a good thing...it allows you to keep doing what you're doing without being "swayed" by the opinions of others. But at some point, you need to pull your head out of the clouds and see what others think. Participating in the Art Crawl allows me do that. It's been gratifying to hear the comments from visitors. I've heard good things about my work and the studio itself. That feels good. It feeds my soul and makes me excited to do more work. This isn't a big-selling event, but it's not about that for me. Don't get me wrong--sales are nice...they make me feel like breaking into song. But it's hearing the feedback from others that keep me going. So I just wanted to share these pics from my studio and send out a thank you to all those who have supported me in getting to this point. And a very special welcome to all my new visitors. I hope you stop by often. A picture of my studio building, the Jax, that shows the mural on the side of the building. A shot of the front of the Jax. The art crawl officially begins tomorrow evening. I have some paintings still to hang and some sprucing up of the studio left. I'm not too happy about the weekend weather forecast. We may squeak by with decent weather Friday evening if the rainstorms can hold off, but Saturday and Sunday look to be cold and rainy. Rainy weather seems to discourage folks from venturing out, but if it's not too cold...Actually cooler weather can be a plus--the studios stay cooler. Hopefully folks will still turn out for the crawl. --Generally start on the top floor of a building and work your way down (except at our building--than start with Studio 300). It's easier and less tiring to go down steps. Don't count on elevators--some buildings don't even have public elevators. --Select a few buildings to begin your crawl experience. I recommend starting with the Jax (again Studio 300) where I'm located. Seriously, the Jax has a high concentration of open studios. Also select at least one building that combines living space with art studios. Try the Tilsner (300 E Broadway)...that's where I will be living shortly. They have a record number of artists participating this year, plus some musical entertainment. --Although you won't find a meal, you will be offered plenty of treats. Some studios even serve wine. There will also be music and performers in some studios or outside buildings. The Art Crawl begins in just under 48 hours. Yikes!!! 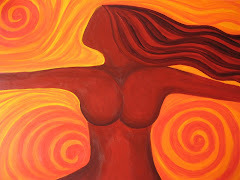 My nerves are starting to kick in, as I juggle finishing some artwork and setting up the studio for a show. I always wish I had a little more time to get more work done. It seems sort of ironic that being so focused on the crawl really cranks up my creative juices and I feel like new ideas are just spilling out of my brain. Maybe I should pretend I have a show every month! I'm heading back to the studio to do a little more work. As soon as I get the studio set up I'll post some pics! Here's a fun video that captures the fun of the St. Paul Art Crawl. It was made by Tilsner resident Nigel Parry at the 2007 Spring Art Crawl. (It has been posted on YouTube and the Tilsner website that Parry moderates). It features work of various Tilsner artists (the building I'm moving into next month!). I know it's long, and if you don't want to watch the whole thing, watch the first 2-3 minutes...it gives you an excellent feel for the energy of the crawl. A tour round the streets, local cafes and shops of Lowertown, meeting some of the members of the Tilsner Artists' Cooperative during the twice annual Saint Paul Art Crawl. Featuring music by Friendly No One and Beck. Filmed from April 20th-22nd, 2007. Camera: James Duncan and Nigel Parry. Editing: nigelparry.net. I am in a state of creative frenzy this weekend. The art crawl is just next weekend and I have loads to do. First off, there is those half dozen half-completed projects that I would like to wrap up. 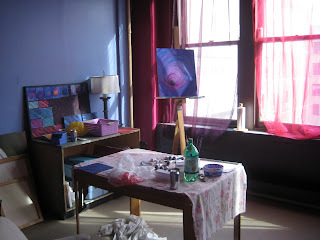 Then there is the cleaning, organizing of the studio into more of a gallery (versus work) space. Oy! It has been hard to focus on the crawl these past weeks...the application process for the move was very distracting. Even now there is a part of me that is in a bit of a panic over moving and wants to be packing and organizing at home. But I am forcing myself to get over to the studio and focus. Once I'm there, focusing is not a problem. I turn on my music and I'm in "the zone". I slept very hard last night...only disturbed in the early morning by horrid leg cramps that I got from standing on concrete all day (at the studio). I'm going to read the paper quick and then to the studio for the day. Until the crawl and the move is over, my etsy shop is being severely neglected. Next weekend I will put my shop on vacation mode--because everything will be offered for sale at my gallery. Once the crawl is over I will be able to post some new artwork that I've been working on for the crawl (unless it all sells! LOL) Bear with me folks! Life is getting a little crazy...but it's a whole lot of fun! Unit #507. Our new home. This is a picture of our apt. door. Yes, I really like this painting, but I will have to feature my own work. Can't wait. Looking into the apt from the dining area. The pic is a little dark and it doesn't really show how beautiful that brick is. I love it. Here's a better shot of the brick wall. A shot into the dining/kitchen area. Another shot from the dining area towards the front door (which is just past those closets). The wood floors that I love. Kitchen shot. Nothing special, but I do like that it's more open than our current galley kitchen. It's official. We will be moving during the month of May. I've been sitting on pins and needles during the application process, afraid to say much about it--lest I jinx the whole thing. So allow me to backtrack a bit to clue you all in. About a month ago, we received the lease extension for our current place. Our lease expires June 1st. Now we love our place; it has many conveniences, loads of character, but with that comes a fairly hefty rent. Joel has lived here some 6 years and I moved in 2 years ago. We discussed the possibility of moving a year ago, but since I had been moving on an annual basis the previous 4 or some years and we were still settling into married life, we decided to stay put. This year we thought about it a lot harder. There would be something nice about living in a place that we picked out together. It would force us to clear out some clutter. We could decorate a new place together. Still moving is hard work, not cheap, and hard work. Joel decided to do a little more research about some the of the artist lofts/co-ops in our area. Generally the rent is considerably less and the spaces can be quite interesting. Joel found 2-bedroom units available in 2 buildings--the Carlton & Tilsner. We looked at the Carlton building first. The Carlton is a newer renovation, located on University Avenue. While it had some great amenities, the living space felt small...it would not easily accomodate our stuff or my stepdaughter's wheelchair. 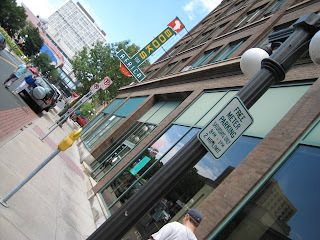 Besides, we realized we didn't truly want to leave our neighborhood of lowertown St. Paul. After looking at the Carlton, we felt we would probably be staying where we are at, but Joel went ahead and looked at the unit available at the Tilsner...just a block from where we live now. After looking at, he called me excited...and we scheduled a time when I could take a look as well. I, too, could see the possibilities. As they say, the "bones" of the space are good. The brick walls are incredible. The light is good (even if my poor pictures don't show it). The unit is on the 5th floor and if you look past the parking lot across the street, you can see the river. We both love the open floor plan and have some creative ideas on how to use it. Yes, the bedrooms are small, but the living room/dining area is huge. We give up the conveniences of this building (underground parking, our own laundry, and 2 bathrooms), but we gain so much. (And we pay less rent to boot). By moving into this building, we will be moving into a vibrant art community. One of the requirements for living in the building is that at least one of the residents of the unit needs to be an artist (that could be a visual artist, writer, or theater person...). I think this idea appeals to both Joel and I equally. 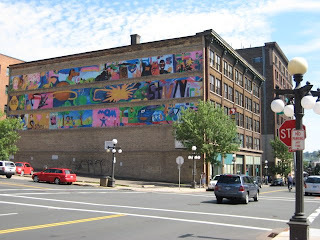 It is what we love about the lowertown community...that it is an artist community. So we decided to submit our application. After 2 weeks of waiting and dealing with setbacks, we got the word today. The unit is ours! We will start our move May 1st...but do it slowly throughout the month (we don't have to be out of our current place till June 1). We are beyond excited. We are thrilled to have a new place that will truly be our first place chosen together. We have already been discussing how to arrange things, what walls we want to paint...essentially, how to make the place "our home". Yup, we've got a lot of work ahead. But we're excited. I can't wait to show you pictures of how it all looks when we move in! 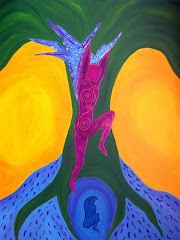 I completed my piece for my first Melange Team mixed media challenge just under the wire. I completed the piece on Thursday and the photos were due on Friday! Of course, I received the challenge materials about a month ago! To backdrack...this was the first challenge put together by the Mixed Media etsy team that I recently joined. The team is comprised of some very talented mixed media artists--all with more experience in mixed media than myself. When the challenge was announced, I joined on a whim. Afterwards, I got a little nervous. The goal was to challenge ourselves, stretch a bit...try something new. And the pressure was that everyone else in the group was working with the same stuff...I certainly didn't want to come up with something awful. It was an interesting experience...somthing I haven't done before. It was definitely something very different than I've done before. Life got more hectic than I anticipated these past few weeks...so putting this project off wasn't necessarily a good plan. But then again, I wanted to be more spontaneous with this project...think less and see what I could throw together. So here it is. I wanted it to feel fun. I used half of a vintage box as my base. I took the tissue paper and had some fun with modpodge to create the background. 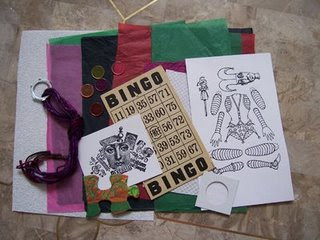 I just couldn't cut up that bingo card, so I left it intact and I added some dice to complete the piece. The fun part came in the reveal...everyone shared pics of the works they created. If you visit the Melange team blog here, I believe you will be able to see some of the pics of the other finished pieces soon. I've been Missing In Action because my best friend, Julie had been in town for a few days. Since Julie is my art-sister, a kindred spirit, we criss-crossed the town taking in all the art galleries and studios that we could in just a few short days. Thursday we enjoyed First Thursday in Northeast Mpls's Northrup King building. Wowza! The Northrup King building is an old, old seed/office building that has been converted to artist studios. The artists open up their studios the first Thursday of the month (along with 2 weekend art crawls each year). The building & studios were simply beautiful...wood floors, spacious...Plus it's a huge building. There are a wide variety of artists in the building--painters, weavers, sculptors, photographers, mixed media...we could not take it all in. I will definitely be returning! Friday we took in the Spring Flower Show at the Como Conservatory. I'll be posting some gorgeous pictures in the days to come. The visit has already inspired some new artwork. Oh ya, Friday evening we managed to sneak in a few art openings just under the wire. Julie and I were relaxing from a busy day when my hubby called and told me about an art opening in the coffee shop just a block away. We ran over and caught the opening in the coffee shop (Black Dog) and AZ gallery next door. AZ was ready to close their doors (it was 9:30 pm), but allowed us to take a quick look...and well worth it. I plan to return for a closer look. Saturday we made a trip to my favorite local museum, the Mpls Institute of Arts. Always so much to see. And always free! Rounding out Julie's visit was lots of good food and good conversation. It was a wonderful visit...busy, but rejuvenating! There's nothing like spending a few days with your best friend.